The recent Gaza crisis, during which Israel responded with a limited military operation to stop Hamas missile attacks against Israeli populations, unleashed a number of reactions by intellectuals in Latin America. Some of these reactions were expected but others raise serious concerns about the direction Latin America is taking in what is called “the battle of ideas”. The reaction to the Gaza crisis by some intellectuals reflects the ideological power of the Bolivarian Revolution and the challenge this revolution will present for us in the future. This time we did not hear mere pacifist statements calling to stop the bloodshed. We heard a much more aggressive discourse that accused Israel of conducting genocide on the Palestinians; promoting expansionism; committing war crimes; and nothing short of serving the devil. These types of accusations are not new and certainly not new for the left. However, if we carefully analyze what guides the viewpoint of these intellectuals the story is hair-rising. Not for the nonsense they say about Israel but rather because of the sources they draw from and its significance in the context of the current political situation in Latin America. For example, Eduardo Galeano is a Uruguayan writer who became famous at a young age when he wrote “The Open Veins of Latin America”, a humorous account of Latin American economic history viewed as systematic exploitation of natural resources by developed countries and imperial powers. Since the transition to democracy in Uruguay, he has become a public intellectual, mostly representing the left. He is often a guest on national TV. He comes across as having a great sense of humor and warmth and remains a popular figure. He is close to the political circles of President Jose Mujica. In reaction to the recent events in Gaza, Galeano launched a strong and vicious attack on Israel, to which I responded here in Spanish. Galeano not only attacks Israel’s specific action but also claims that Israel was built at the expense of the Palestinians and continues to expand. What is curious about Galeano is that he literally uses elements drawn directly from Arab propaganda and distortion. Using the most vicious Arab propaganda he claims “the persecution of the Jews has been an old European habit but in the last half century this historical debt has been charged to the Palestinians who have never been anti-Semitic. Furthermore, they are Semitic themselves.” Galeano suggests that Israelis kill civilians on purpose, “knowing exactly what they are doing”. The military industry is “successfully testing (its equipment) in this operation of ethnic cleansing”. In another passage Galeano argues that the threat of a nuclear Iran is an invention of the pro-American media and that the real nuclear threat comes from the Americans because they burned Hiroshima and Nagasaki. The international community is repudiated by what Galeano calls another “piece of theater put on by the United States”. Another intellectual who follows this same line of thought is Atilio Boron, an Argentinian columnist for a major national daily, a PhD from Harvard University and a person very close to the political circles of President Cristina Kirchner. What is interesting is that Mr. Boron accuses Israel of murdering civilians but in regard to Syria he claims that the uprising against the tyranny of President Bashar Al Assad is nothing more than an “imperialist conspiracy”. Boron implies that the Syrian regime, that has already killed more than 40,000 people, is not a murderous regime but it is a victim. He also holds Israel responsible for increasing tensions with Iran, despite the fact that it was Iran that broke off diplomatic relations with Israel 30 years ago. Iran has also expressed its desire to destroy Israel, and has sponsored terrorist activities against it. Furthermore, using language drawn directly from Iranian President Mahmoud Ahmadinejad and even Neo-Nazis, Boron blasts Israel for using the Holocaust as a way to blackmail the world. Of course, they both justify Hamas hostility against Israel because Israel is the “repressor”. Hamas is not at fault and its past suicide bombers against Israeli civilians or the bombardments of Israeli populations are not mentioned. The fact that Israel withdrew from Gaza seven years ago or offered peace concessions that were rejected altogether by the Palestinians does not seem to be important either. What is important is that Israel is a U.S. ally. They detest American power with all their might. But the most astonishing public figure and intellectual is the Nobel Prize laureate from Argentina, Adolfo Perez Esquivel. Mr. Perez Esquivel received the prestigious prize for his activism on behalf of human rights. He strongly opposed the Argentinean and other Latin American dictatorships during the 1970’s and 80’s and became a star during a dark time where tragic events where occurring in the Southern Cone of Latin America. Like the previous public intellectuals I mentioned he blames Israel for the conflict in Gaza, calls it a “terrorist state” and initiated a letter calling for a boycott of Israel. He drew on people like Noam Chomsky and 50 other like-minded individuals to participate in this effort. In an article published on November 20th, Perez Esquivel wrote the following paragraph: “When will the international community stop allowing Israel to act with impunity, without attempting to limit its aggression against the Palestinian people? When will the United States and the European Union stop being part of the aggression against the people of the Middle East, Palestine, Syria, Libya, Afghanistan and Iraq? When will they stop threatening Iran? As the European Union received the Nobel Prize, Perez Esquivel repudiated the European countries’ intervention in the conflict in Libya and warned them of intervening in Syria, as well. Of course, this human rights activist does not mention that in both the case of Syria and Libya, we are talking about murderous dictators that launched a merciless war against their own people. Perez Esquivel continues “This event was the perfect excuse to launch a war against Afghanistan and Iraq and now against Libya”. In the same letter the human rights activist and Nobel Laureate accused the United States of committing the worst atrocities in the world to keep world power. Finally, he calls the U.S. an “axis of evil”. These three intellectuals are strong supporters of Hugo Chavez and his Bolivarian Revolution. They also support the half -century old Cuban dictatorship. While three decades ago they were active in the struggle for democracy in the Southern cone, they now have no problem supporting Hugo Chavez, a putschist who in the name of economic and social justice subjugated the judicial power; limited freedom of the press; persecuted opponents; organized Para-military groups to intimidate people and potential opponents; who now controls the electoral council and has forced thousands of Venezuelans into exile. This is without mentioning Venezuela’s attempt to destroy the Human Rights Commission of the Organization of American States. Galeano, Boron and Perez Esquivel are not just identified as bloggers or anonymous fanatics that run colorful website pages. These are opinion leaders who are respected in their societies. But the most important point is that they are public intellectuals that not merely support the Bolivarian Revolution in its political form. They are also part of its ideology including the anti-imperialist lunacy, the admiration for tyrants and the delirious and venomous conspiracy theories that this revolution wishes to propagate. In past writings, I mentioned how Chavismo will survive without Chavez and showed how this will most likely happen in Venezuela. I also mentioned that the Bolivarian revolution has absorbed many elements of the left, including moderate elements, and is gradually succeeding in achieving a regional unified message in what seems to be a continental movement of the left. Now, the case of these three public figures shows that the Bolivarian Revolution has established its hegemony in the form of ideas and prejudices that will be very difficult to remove in the years to come. The Post-Chavez era will survive as a movement because it no longer depends on Chavez’s personal well-being for its ideological survival. All this shows that ideas matter and that the intellectual left in Latin America has and continues to have an enormous impact influencing the thinking of large segments of their societies. 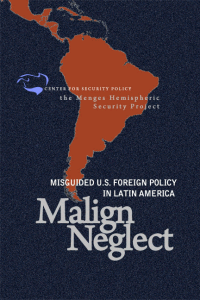 Since the United States has retreated from communicating our ideas and values, many old notions about the U.S. as an exploitive and expansionist power still hold sway in the minds of many Latin Americans. By not taking seriously or participating in the political and ideological debate, our side will never be heard and freedom and democracy in Latin America will suffer as a consequence. Thank God for Luis Fleischman. This sad situation requires an energetic and inspired American response. What can I do? Very interesting. Would you consider writing an article about the main conservative or pro-capitalism public intellectuals in Latin America? Happy for you to e-mail me some names as well. Victor, what is your point? I think Victor’s point is that it would be good to hear what the Latin-American Right is saying, in order to compare. 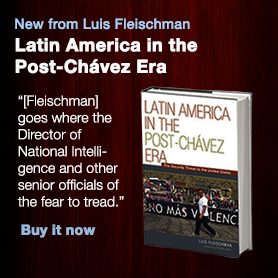 Fleishman does not give us a balanced view of Perez Esquivel’s opinions, although to be sure most Americans (and no doubt most Israelis) will have difficulty restraining indignation long enough to perceive the nuances. Perez Esquivel has been a tireless fighter for human rights for a very long time, on many fronts. Very few people who have taken dangerous public positions over the long haul in many different contexts are free from errors in judgement. It takes a certain temperament to survive decades of opposition, not to mention imprisonment and torture, and it is easy enough to sit comfortably on the sidelines while criticizing others for lack of balance. Not even Nelson Mandela got it right all the time. I would take P-E’s opinions any time in preference to the many, many Americans I knew who worked for the oil companies and turned a deliberate blind eye to what was going on in Chile and Argentina–if not actively supporting Pinochet and the Argentine junta. It is so difficult for Americans (and Israelis) to see ourselves as much of the world sees us. It is rather simplistic thinking latinamerica’s left intellectuals who are against the behavior of Israel are under the influence of Chavez’ ideology. Not only them think that. It’s much more transversal. From the politic center to the left and even much people with right wing sympathies support palestina. Most latinamerica’s people support palestina. You obviously think we are all wrong. Well, we can debate. But please use arguments.